or crack, even in extreme cold. rubber rollers do. 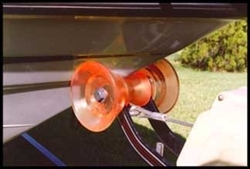 No more hard work cleaning the bottom of your boat. MADE IN THE GOOD OLD U.S.A.
You will never find a "MADE IN TAIWAN" or "MADE IN CHINA"
Enjoy your boat and trailer! Wesbar Trailer Plug Adapter, Round 7W-5F FEMALE 18"